Cannes Lions today saw the inking of a global partnership that will work to transform mobile marketing. Dentsu Aegis Network struck a global strategic partnership with Tencent enabling them to pool their resources on key collaborative initiatives. As part of the agreement, Tencent will become one of two exclusive partners in Dentsu Aegis Network’s Mobile Stack—the other being a leading global social network from USA—to shift the current approach to mobile marketing. This new collaboration model will enable brand owners to gain valuable data-driven consumer insights that they can harness to optimise content creation and distribution on a global scale. Jeff Kwek, general manager, key accounts and channel business, Tencent Online Media Group, remarked, "This partnership will involve science, data and technology, but its continued success also depends on the art of communication and of working together." The two companies already have an existing framework for data solution synergy and collaboration, in place since 2015. The new global partnership will further the cross-fertilization of competencies and form a united front within the marketing ecosystem. "China’s ubiquity and abundance of data test our capabilities in envisioning and developing the most compelling customer journey for client brands," Motohiro Yamagishi, chief executive officer of Dentsu Aegis Network China, said. "The cooperation with Tencent gives us the opportunity to help our clients navigate this complex market." With access to Tencent’s trove of smart data, Dentsu Aegis Network will be empowered to better deploy its data analytics and brand marketing capabilities. Their collaboration will simplify how the two parties determine and activate brand engagement, identify the moment of intent for brand owners and optimise mobile user experiences. 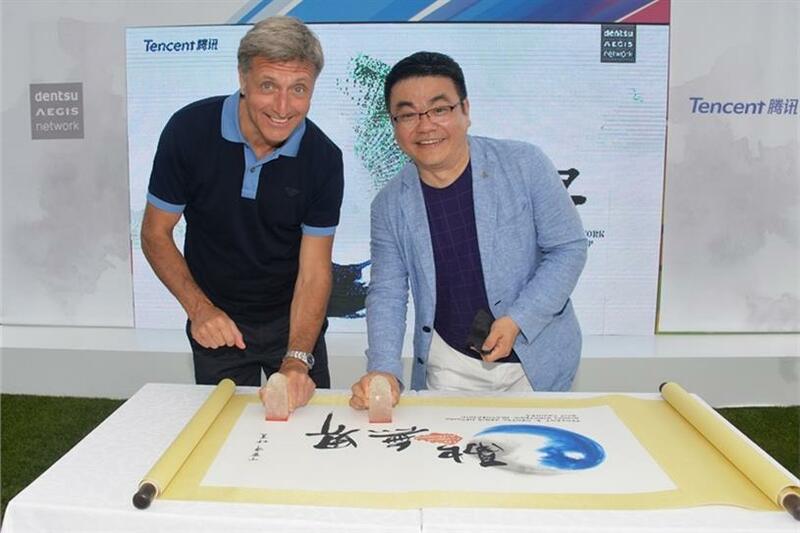 "I am confident that a closer relationship with Tencent in China, as our strategic partner will drive innovative and market-leading solutions to better serve client needs" said Jerry Buhlmann, chief executive officer, Dentsu Aegis Network. Hoping the partnership will help them do more for the industry, SY Lau, senior executive vice president, chairman of Tencent advertising, chairman of group marketing and global branding, said: "The media and marketing industry needs a constant infusion of new talents with new mindsets. And together, we will merge marketing technology with the art of creativity to impact business goals." The Dentsu Aegis Network X Tencent university program is designed to develop digital marketing professionals for the future, to share best practices and promote digital education. The two parties are joining forces to offer lectures about new business models, market trends, insights, and technological innovations. This announcement comes on the back of Mary Meeker’s 2017 Internet trends which reported that mobile users in China spend more than 55 percent of their online time on Tencent platforms, namely including QQ, Qzone, Weixin, Tencent Video and Tencent News. She also reveal that with 700 million mobile Internet users, mobile Internet consumption surpassed that of television in China last year.